I often get asked by friends how to cook Indian-style vegetables. Indian dishes are usually cooked in three simple steps: preparing the base (usually cumin, onions, or both, spices), caramelizing the main ingredient (veggies, meats, poultry) and adding finishers/ enhancers (broth, water, herbs). For veggies, we usually skip adding any liquid since they are usually 60-80% water. So this week, I made some killer aloo baingan (potatoes with eggplants), aloo saag (potatoes with bitter greens) and bandh gobi (cabbage). Since the method was almost identical, I’ll just list the ingredients and then describe the process. Dishes take around 30-40 minutes in total. Apparently, the word “baingan” in Hindi for eggplant comes from “bey gun” or “lacking virtues”! I think this veggie has unjust bad rap (as do potatoes, but that’s a whole other blog post). Across the English speaking world, this lovely vegetable is known by multiple names: eggplant in North America, aubergine in Europe (from the French language) and brinjal in India. Although traditionally in Northern India, saag refers to mustard greens, and sometimes spinach, I actually don’t like spinach cooked Indian style. I use broccoli rabe / rapini which mimics mustard greens well, with a pleasant bitterness. In India, we cook cabbage with extra ginger to counter its gas-producing qualities! Ginger can also be added to other gaseous foods like beans, lentils and other legumes. For all the veggie dishes, heat oil in a saute pan and lightly brown the onions (if using). Add in the cumin seeds/mustard seeds until they pop (20 seconds or so), add in the dry spices and fry for about 30 seconds. Add in the ginger/garlic/tomato pastes/stock cube and fry for a minute until the oil looks as if it has separated from the pastes. Add in the vegetables, mix well, cover and steam cook on reduced heat for 30 minutes or until cooked. In the case of potatoes, cook the potatoes for 10-15 minutes with the lid on and then add in the eggplant/ rapini as they’ll take less time to cook. Garnish with finely chopped coriander and serve hot. 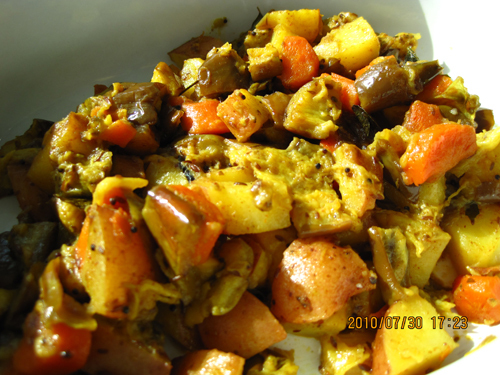 In this veggie dish (potatoes, eggplant), I had some carrots left over so I tossed them in!